A lot of people who come over here to teach end up rarely using their kitchens. This is for a few reasons. The first is that generally the kitchens in the apartments supplied by the schools are not what we’re used to at home. For example, my kitchen currently has two burners. I have no microwave and no oven or toaster oven. (A toaster oven will be one of my first purchases next pay check.) The second reason is that you can eat out at Korean restaurants for very little money. In fact, if your Korean skills are good enough, you can have pretty much anything delivered to your apartment too, even if the meal is only 3 000 won. Despite all of this, I am using my kitchen quite a lot. And not only to make peanut butter sandwiches. (Although I have consumed an alarming quantity of peanut butter since arriving. Oops?) Mostly this is because I like cooking but it’s also because comfort foods, like spaghetti, are not readily available in my neighbourhood. Hence, I make somewhat frequent trips to the grocery store. As I have mentioned before, this isn’t always a simple task. I have been drinking 1% milk rather than skim because that’s the only thing that I know for sure is milk. The first time I tried to purchase milk I discovered upon my first sip that it was actually milk’s gross cousin, cream. I also bought rice today, and soy sauce to go with it. That was time consuming. The rice was simple enough to find. The soy sauce, on the other hand, was challenging. There were two complete aisles of dark brown or black sauces and it took me until the end of the second aisle to find the bottles that said “soy sauce” in tiny writing. I’m just grateful that it was written in English at all. And here’s a surprise for the elusive catagory: garlic. Although perhaps it was less elusive and more camouflaged. I have strolled the produce sections many times now, looking for bulbs of garlic. I once found a bag of pre-peeled cloves but that just wasn’t going to cut it for me. 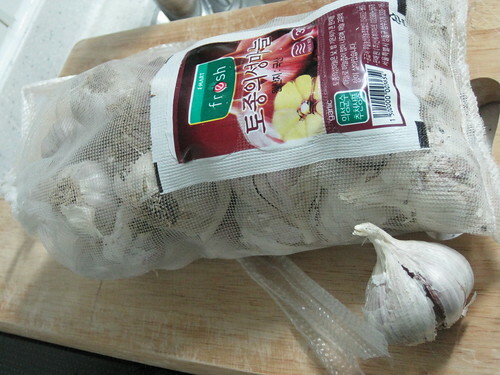 I know that Koreans use garlic in their cooking, so I figured I must have been missing something. As it turns out, I was missing a BIG something. Seriously. Does anyone know the best way to store garlic long term? Send your addy (when you figure it out, haha)… I want to send you a little care package! 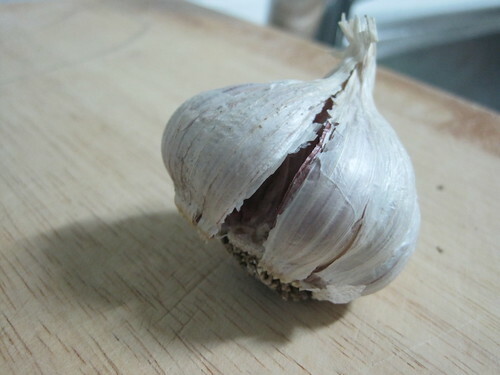 I used my librarian skills of deduction to find out that garlic can be frozen. Or stored in a cool dry place out of direct sunlight, but it will last far longer frozen. I love your stories about Korea! Your mother was by yesterday and offered to send me your blog. I hope you don’t mind. I have been reading about your adventures in Korea and at times laughed out loud. Your take on your experiences is wonderful. You sure have a gift for writing. I’m a bit embarassed to write back. I also loved the video. Did you take most of those pictures. Another great talent! They were just amazing. I would like to continue to be upated through your blog if that is okay with you. I loved everything about it.